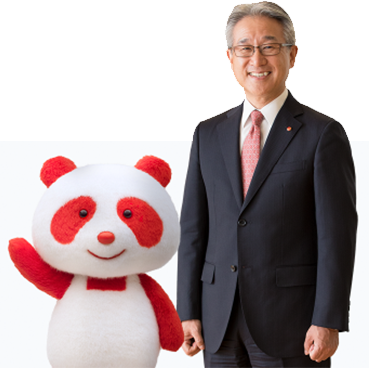 AjiPanda®, mascot of Ajinomoto Co. Inc. and Takaaki Nishii, Representative Director, President & Chief Executive Officer of the Ajinomoto Group. As part of Ajinomoto Co., Inc.’s Global Brand Initiatives, Ajinomoto Windsor, Inc. is changing its name to Ajinomoto Foods North America, Inc. to create brand consistency across North America. The company’s rebranding structure will utilize the new Ajinomoto Global Brand logo – setting the stage for global consistency and a unified management. Ajinomoto Foods North America fully supports the decision behind the new global brand logo, designed and released by the Ajinomoto Co., Inc. We have began efforts to fully transition with the global brand logo and will continue to do so in the future. technology, and our unceasing efforts to build a more sustainable world. possible by Amino Acids, experiencing the Joy of cooking, eating, and a comfortable life. This line evokes the future growth and development of the Ajinomoto Group.